The Women's Enterprise Program is a social enterprise model through which pastoralist women from the NCA are able to gain marketable skills and earn an income. KRO and Aid Tanzania work in tandem to encourage the development of small-scale industry amongst the pastoralist women living in the NCA. KRO helps the women produce beautiful handicrafts for sale in Tanzania while Aid Tanzania helps develop other markets for the merchandise in other countries. 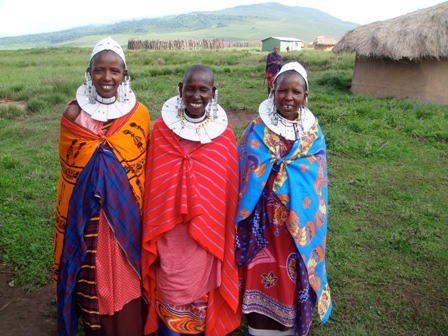 The women make a variety of home, lodge, wedding and holiday decor products in addition to items suitable for unique corporate gifts and fundraising by other charitable organizations with programs in Tanzania. In 2016, more than 150 women participated in the group at various levels. Contact us! We can put together "FUNDRAISING CHESTS" for charitable organizations with programs in Tanzania, or for booster clubs, sports clubs or teams, pep clubs in your own country. We can produce earrings, wine rings (wine charms), bracelets, keychains and other gifts in school colors for fundraising.